Who doesn’t love a coffee coupon!? Pacific Coffee is offering “Buy one and get the next for $1” coffee coupon for the month of July 2010. Print a copy or go green and upload this to your phone and show to the staff for the deal. 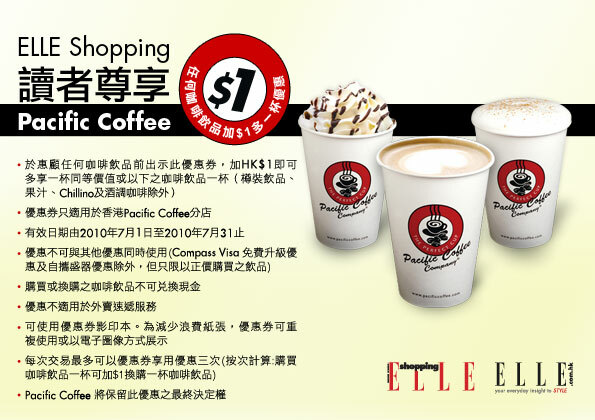 Offer valid throughout Hong Kong (includes HKI, KLN, and NT). This excludes bottled drinks, liqueur coffee, and Chillinos. Limit of 3 transactions per person at one time. The second cup of coffee must be of the same or lower value. Does not apply for delivery services nor can be exchanged for its cash equivalent.